Destroy all artifacts. They can't be regenerated. 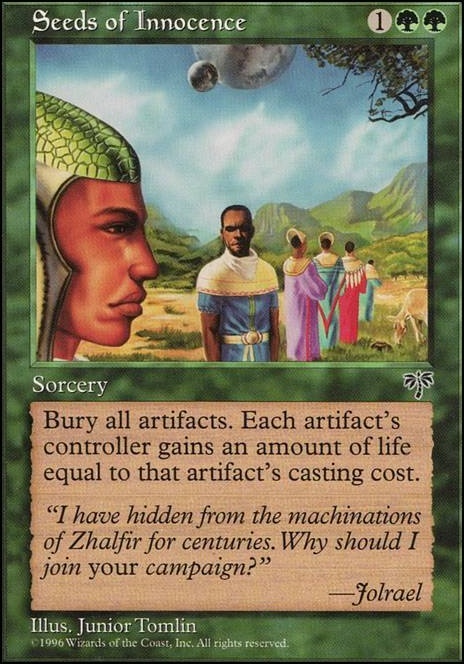 The controller of each artifact destroyed this way gains life equal to its converted mana cost. No problem, I'm a tad curious as my meta is highly competitive and since we have similar deck builds with my Intet and your Yennett I was wondering how yours would do in my type of games. I did take a gander at the section and I like it! I like reading up on how people do on their games! 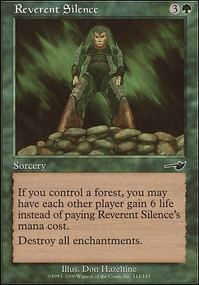 Reason why I would consider, is that even as fast as we spit out mana rocks and such there is tech cards like Seeds of Innocence , Meltdown , and By Force running pretty rampant. So my question actually is, how is your meta like? Great list you have! Here might be some cards you can consider for more effective ramp package, control, or protection. 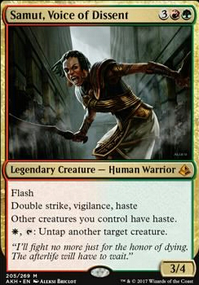 And what do you think of a Mnemonic Betrayal package in your meta? Cards like Seeds of Innocence, Rampage of the Clans, Pernicious Deed lets you chain together your opponent's positive mana resources. hkhssweiss: Seeds of Innocence is a great card and I’d be running it if my meta was more artifact heavy. Glad you like the decklist! DrkNinja: Thank you for the suggestions! 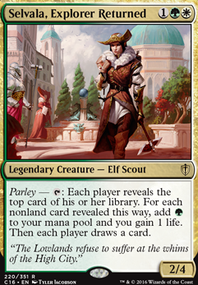 My Elfball package is pretty fleshed out at the moment, currently the only elf I’m considering adding is Selvala, Heart of the Wilds. I’m not sure if I could utilize her to her fullest potential in this build though so I’ve been hesitant to go that route. Definitely a great well thought out deck and excellent primer. +1 from me. I can't really think of any cards so far that would really increase the deck efficiency as you already know what to upgrade and it's just the budgeting that's the issue. If you run against a lot of artifacts, have you considered running Seeds of Innocence? Yeah I going to test it out and see how it does, the only reason I would run Seeds of Innocence is because that is the only low cost mass artifact destruction aside from Vandalblast. 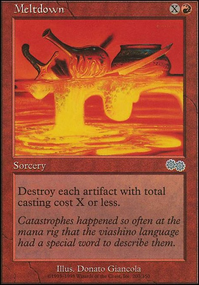 Well mainly it was a tech card from my abzan deck as I'm unsure if there are any other mass artifact destruction in Temur colors that is instant speed. Null Rod has the advantage of leaving lands alone, which could be helpful if you can consistently outrun greedier manabases with fewer lands. Its main disadvantage is that it cripples Top and Scroll rack. If you think the upside is worth it, then maybe give it a run. Otherwise I would stick to Root Maze. Seeds of Innocence is cool, not costing too much and it might be a good call. However its sorcery speed, cmc of 3 and cost are considerable drawbacks. By all means, test it, but mind these problems and take note how much they do or do not influence its use. 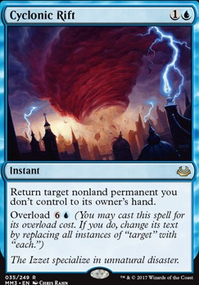 Guttural Response, along with Pyroblast and Red Elemental Blast, is a high ceiling, low floor kind of card. In a predominantly blue interactive meta, it's a must have that wins counterwars out of nowhere because of its low and liberal mana cost (it might as well be in a deck like this). Outside of that, its virtually useless. So yeah, if your meta really has that much blue and interaction, it's a great pick. But it's one of those cards I think you should swap between games if you're going into a casual pod simply because even if your deck is strong there, topdecking a card that's as close to useless as a playable card can get feels bad. Hey thanks for getting back to me JohnnyCRO! Yeah I used to run Natural State, the more games I played, the more it seems Autumn's Veil has been under performing. That might be actually swapped out soon, Stubborn Denial is generally great, but I'll most likely add in Flusterstorm first my meta is fairly high level so our decks are tuned for fast paced matches. 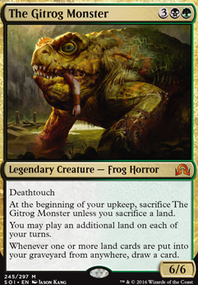 Root Maze is an amazing card and definitely slows downs decks, most notably Tymna/Thrasios Paradox and Storm decks. It considers testing as I do have two spare copies laying around. 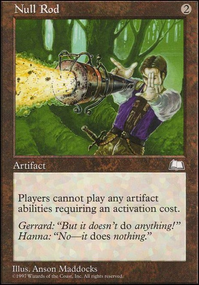 I am wary of running Null Rod due to running Scroll Rack and Sensei's Divining Top, I don't really care for my mana ramp if it stops other people from using their artifacts which is why I think Seeds of Innocence is better in this scenario.